ASHEVILLE - The Asheville Area Plug-in Electric Vehicle Plan has been released to the public to support Plug-in Electric Vehicle (PEV) readiness efforts in Western North Carolina. Over the past year the Land-of-Sky Clean Vehicles Coalition has worked with a broad group of stakeholders in the Asheville metro area to identify and address barriers to electric vehicle adoption. 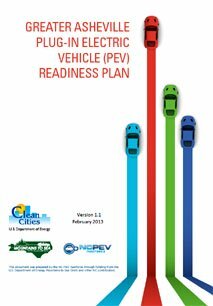 The Asheville Area PEV Plan provides local governments, businesses, educators and other key partners with a roadmap of strategies to prepare the Asheville region for electric vehicles. This planning project was part of the North Carolina Plug-in Electric Vehicle Readiness Initiative, a statewide effort funded by the U.S. Department of Energy to develop a North Carolina PEV Roadmap and four community PEV plans for metro areas within the state. Community PEV plans were developed for the Asheville region, the Charlotte region, the Piedmont Triad, and the Research Triangle. The planning region for the Asheville Area PEV Plan includes the counties of Buncombe, Haywood, Henderson, Madison and Transylvania. Plug-in electric vehicles, such as the Nissan LEAF and the Chevy Volt, have been on sale in the Asheville region since the fall of 2011. Based on projections made by the Electric Power Research Institute, there may be over 8,000 plug-in electric vehicles on the road in the Asheville region by 2020. “As battery prices come down and gasoline prices continue to rise we can expect PEVs to become an attractive option for more and more car buyers every year,” says Bill Eaker, who leads the Land-of-Sky Clean Vehicles Coalition. Over 40 public charging stations have already been installed in the Asheville region to support PEV adoption, including a dozen solar-powered charging stations installed by Brightfield Transportation Solutions, an Asheville-based start-up. Many of these charging stations were also locally manufactured by Eaton Corp. at their Asheville facility. This level of charging station deployment is high for a region of Asheville’s size, but there are still large gaps in this regional network of public charging stations. Targeted locations for additional public charging stations, such as downtown areas in Brevard and Waynesville, are identified in the Plan. You can download the Asheville Area PEV Plan in its entirety or by chapter below. Alternatively, the plan is also available at Plug-In NC's Resource Page.